Important 2018: This site is no longer a U.S. friendly bingo site. Since 2002 Vic's Bingo has been offering licensed and certified online bingo play for real money. Contributions are made to special child advocacy groups, and responsible gaming is supported. There are dozens of bingo and non-bingo games offered. Bonuses and other promos are generous and frequent, and US players are legally supported. If you enjoy mobile Internet bingo on your smartphone or tablet, Vic's Bingo supports your on-the-go play as well. Additionally, convenient and safe credit card funding has been provided. A free welcome bonus gets you started, and arguably the best bingo software online delivers a dependable and thrilling experience, so let's take a closer look. Vic's Bingo is a site that has been in a leader in the industry since 2002. And quite frankly you don't last that long in the industry unless you are reputable and offer a good product to players. Their bonuses are second to none and offer players some incredible promotions to get you started on a winning track. New players can take advantage of their generous 2500% promotion where they award each of your first 5 deposits with a massive 500% bonus. Absolutely. Since they've been in business since 2002, this gives them longevity in the industry which is earned. Rogue sites go out of business very fast as bad news travels fast on the internet. Parlay Games software is on board and is widely recognized as one of the top bingo software suites found online. The software is extremely customizable, and Vic's Bingo has used it to deliver a fun pink and light purple interface. That software also provides access to progressive bingo games integrated with players from around the world at other Parlay sites. This leads to jackpots frequently offering many thousands of dollars, and the software is known for dependability and speed. Bingo is either downloadable or played through the browser Java version. Licensing and certification - Is Vics Bingo Legal For American Players? Unlike the United States, there are those offshore and international locations which have legalized Internet gambling as an industry. Government supported legal licensing was obtained and is maintained by Vic's Bingo in Gibraltar. 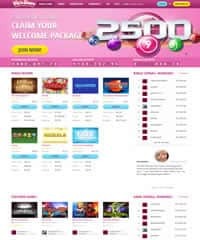 This legitimate certification by a renowned online licensing provider means that not only international players, but US bingo lovers as well, can sign up and play bingo, slots, video poker, keno and pull tabs for real money. The first deposit bonus we found during our Vic's Bingo review is a generous 500% which can actually be claimed on your first 5 deposits to the site. There is also an immediate $25 welcome bonus that you receive without depositing any money at all. Your second bonus for making a deposit on the site for real money bingo play is 300%. For instance, deposit $100, and you would receive an additional $500 added to your bankroll for a total of $600 after your first deposit. Other bonuses and promotions include the Candlelight Delight and Hilda's Revenge games found at other Parlay software bingo halls, which give you access to special deposit bonuses and free games. Big Brother Saturday means a 175% bonus on all your deposits for that 24-hour period, and there are frequent weekly, monthly and seasonal bonuses and promotions offered. The games offered at Vic's Bingo are bingo, slots, video poker, keno and pull tabs. There are both free and pay for play slots and video poker variations, as well as nearly a dozen pulltab offerings. Slot machines are 1 line, 5 line and 9 line, and there are nearly two dozen to choose from. Slots betting starts at a nickel per spin and goes to $1. Bingo cards start as cheaply as $0.05 and run as much as $1. Vic's offers $1,000 hourly coveralls as well as multiple progressive games which tap into the Parlay Internet bingo sites located around the web. This means in some cases jackpot bonuses worth thousands of dollars. Many of the bingo games offered are chat enabled. Moonlight Madness, Happy Hour, 1-2-3 Wednesdays, Speed Bingo, TGIF and Bingo Sunday Cinema are just a few of the many specialty games the site offers. The Quarters Room is well known in the Internet bingo industry as delivering enjoyable and sociable bingo chat games, and the Vic's Bingo Chat Monitors are industry recognized for producing exciting and fun interactive bingo. Vics uses what is called Secure Socket Layer technology which encrypts your connection to the site and helps keep your sensitive information completely safe. You can verify whether a site uses SSL by looking at the top bar in your browser and looking for the green lock and the https:. International bingo players have an easier time than US gamers do at Vic's Bingo. This is in no way a detraction to the site, and has to do with stringent US regulations concerning online gambling deposits. Because of this, withdrawals for US players are limited to bank deposits and courier check. However, convenient credit card funding is offered through major credit cards like American Express, MasterCard and Visa. Money transfer options through MoneyGram and Western Union are supported for US and international players, as well as deposits via bank transfer. Is Vic's Bingo Mobile Friendly? Yes, all bingo and casino games are in fact mobile friendly at Vics Bingo. Whether you're on an iPhone, iPad, Android or Windows, they've got an app for you. Owned by Winward Gaming Group, a recognized Internet gaming leader for providing online bingo, Vic's Bingo delivers a wide variety of popular games, specialty games, potentially large jackpot paydays and what is arguably the best bingo software in the industry. While withdrawal options are limited for US players, deposit options and bonuses for them and their international counterparts are various and generous. There is no need to deposit any money to get started, as the free no download $25 sign up bonus allows a new player to get the feel for the site without investing any of their own money. With chat moderators that have been recognized as some of the most professional and enjoyable in the business, Vic's offers a fun and social experience for online bingo players. The Parlay name means reliable, safe and secure software which is also exciting, and with mobile as well as PC support, Vic's Bingo offers a great Internet bingo experience. You can check out our additional evaluations by visiting our page that lists all of our online bingo reviews.